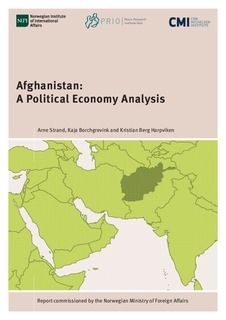 This report provides a comprehensive analysis of the current state of Afghanistan, arguing that the Afghan state is fragile, and sustained through constant negotiations over power, resources and ideology. What began as a radical state-building and democratization project in 2001 was soon captured by elites. Some of which engages in semi-formal and informal governance structures to further their influence. Distribution of state revenue, largely from external donors, has been used to secure loyalty and maintain control. This has contributed to extreme state centralization, hampered development of state institutions, failed justice sector reforms, high levels of corruption and reduced government legitimacy, and lately an increase in poverty. On the positive side, access to education and health services has improved, partly due to the strong emphasis placed on the rights of women. The security situation has deteriorated since 2014. At present the government control less than 60 percent of the country and civilian causalities are steadily increasing. Conflicts in Afghanistan are exacerbated by the involvement of its neighbors. To improve security, as well as economic and social development, a negotiated peace settlement is needed. If the conflict is left unresolved (in fear of regional and international security concerns), a slow and steady deterioration of security, and economic and social development, is to be expected.